ANN ARBOR–As many as one in three women treated for breast cancer undergo unnecessary procedures, but a new method for diagnosing it could do a better job distinguishing between benign and aggressive tumors. "We overspend $4 billion per year on the diagnosis and treatment of cancers that women would never die from," said Greg Thurber, U-M assistant professor of chemical engineering and biomedical engineering, who led the team. "If we go to molecular imaging, we can see which tumors need to be treated." The move could also catch cancers that would have gone undetected. 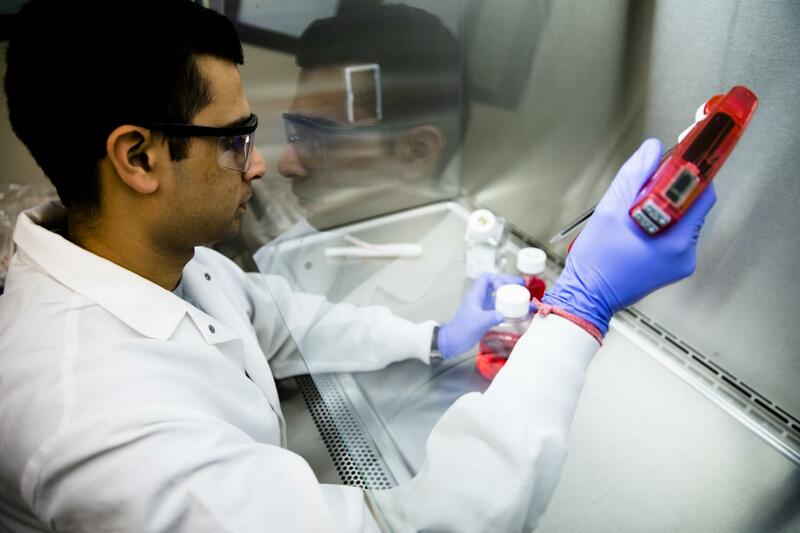 Thurber's team uses a dye that responds to infrared light to tag a molecule commonly found on tumor cells, in the blood vessels that feed tumors and in inflamed tissue. By providing specific information on the types of molecules on the surface of the tumor cells, physicians can better distinguish a malignant cancer from a benign tumor. Compared to visible light, infrared light penetrates the body easily–it can get to all depths of the breast without an X-ray's tiny risk of disrupting DNA and seeding a new tumor. Using a dye delivered orally rather than directly into a vein also improves the safety of screening, as a few patients in 10,000 can have severe reactions to intravenous dyes. These small risks turn out to be significant when tens of millions of women are screened every year in the U.S. alone. But it's not easy to design a pill that can carry the dye to the tumor. "To get a molecule absorbed into the bloodstream, it needs to be small and greasy. But an imaging agent needs to be larger and water-soluble. So you need exact opposite properties," Thurber said. Fortunately, they weren't the only people looking for a molecule that could get from the digestive system to a tumor. The pharmaceutical company Merck was working on a new treatment for cancer and related diseases. They got as far as phase II clinical trials demonstrating its safety, but unfortunately, it wasn't effective. "It's actually based on a failed drug," Thurber said. "It binds to the target, but it doesn't do anything, which makes it perfect for imaging." The research is described in a study in the journal Molecular Pharmaceutics, titled, "Oral administration and detection of a near-infrared molecular imaging agent in an orthotopic mouse model for breast cancer screening."